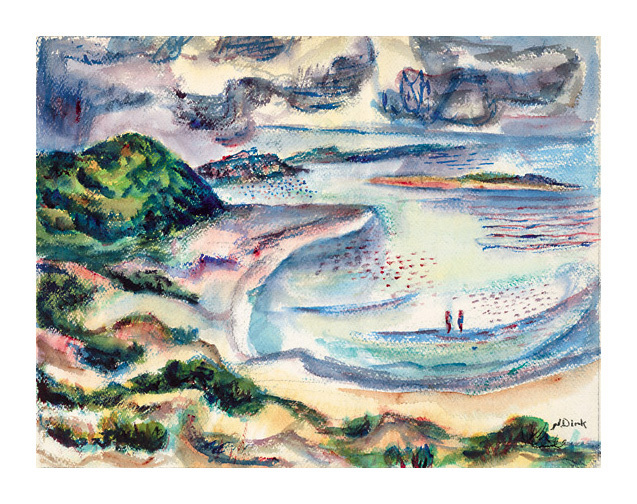 Nathaniel Dirk studied at the Art Students League with Max Weber and Kenneth Hayes Miller and in Paris with Fernand Leger. He taught at the Art Students League and lectured there on "Color for the Artist" from 1957 through 1960. 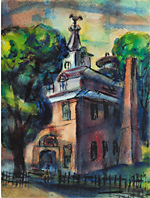 He was president of the Cape Ann Society of Modern Art and a member of the Rockport Art Association. He exhibited widely, with thirteen one-man shows in New York City alone. His work is represented in the collections of the Brooklyn Museum, the Whitney Museum of American Art, the National Academy of Design and the Art Institute of Chicago. 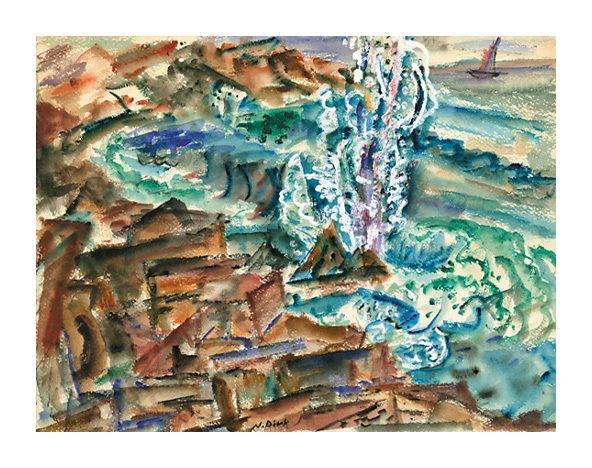 Song of the Spray (Ogunquit) - - c.1933, Watercolor. Signed, lower center. Titled and numbered 229 in the artist's hand, verso. Image size 14 1/8 x 18 1/4 inches (359 x 464 mm); sheet size 15 x 20 inches (381 x 508 mm). A fine modernist work, with fresh colors, on watercolor paper, with margins. The artist's tack holes in the sheet edges; surface soiling, verso; otherwise in excellent condition. 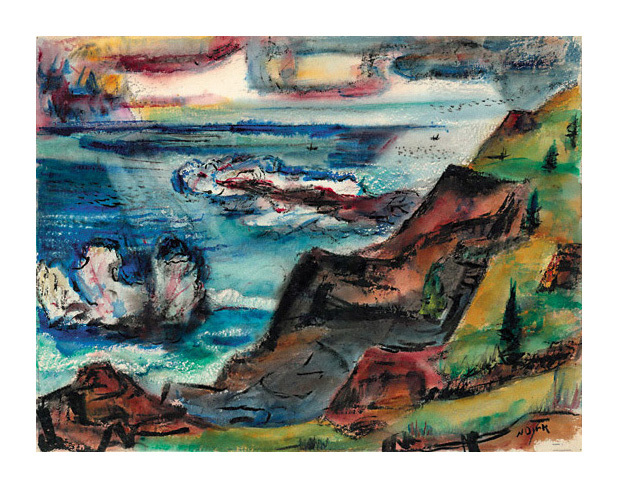 Untitled (Cape Ann Coast) - - 1947, Watercolor. Signed, lower right. Titled in the artist's hand, verso. 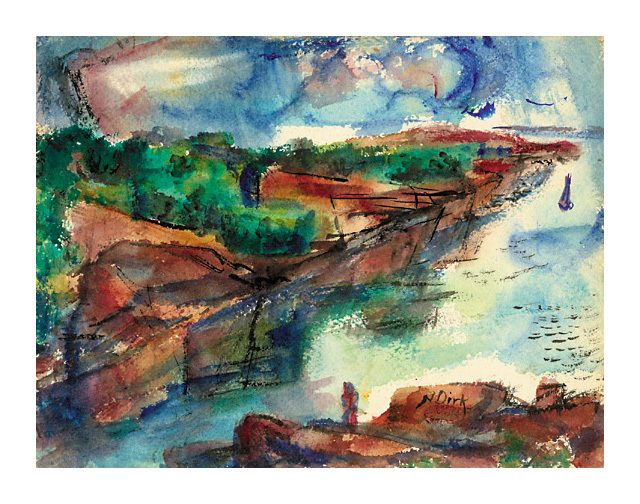 Image size 7 5/8 x 10 1/4 inches (194 x 260 mm). 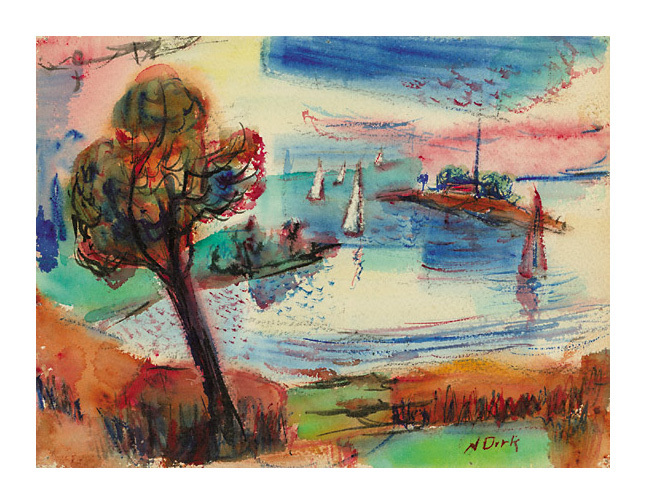 A fine modernist work, with fresh colors, on heavy watercolor paper. The artist's tack holes in the sheet edges; surface soiling, verso; otherwise in excellent condition. 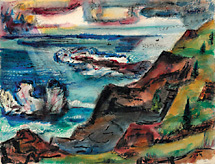 Untitled (Rockport Fishing Boats) - - 1948, Watercolor. Image size 7 1/2 x 10 1/8 inches (191 x 257 mm). 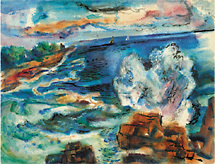 Bursting Dawn - - c.1948, Watercolor. Signed, lower right. Titled and numbered 745 in the artist's hand, verso. Image size 14 1/4 x 18 1/2 inches (362 x 470 mm); sheet size 14 3/4 x 20 inches (375 x 508 mm). A fine modernist work, with fresh colors, on heavy watercolor paper, with margins. The artist's tack holes in the sheet edges; surface soiling, verso; otherwise in excellent condition. 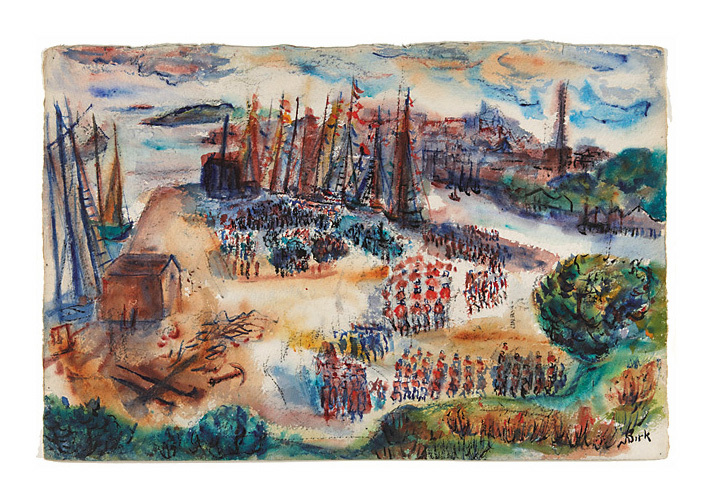 Echo of an Old Story - - c.1949, Watercolor. Signed, lower right. Inscribed “Echo of An Old Story” Joy Peddler A. Schoenffelt 798 in pencil, verso. 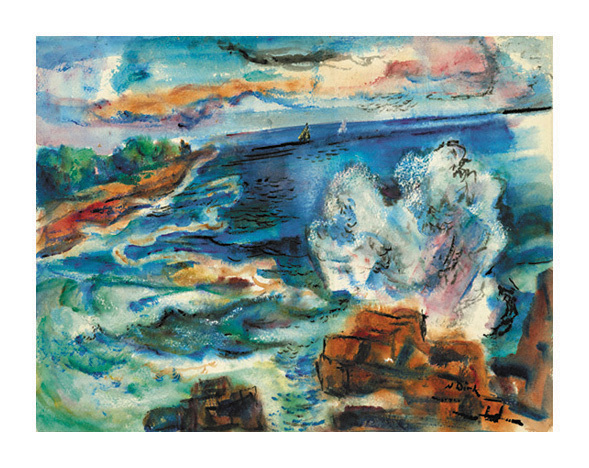 Image size 14 7/8 x 22 3/8 inches (378 x 468 mm). A fine rendering, with fresh colors, on extra heavy watercolor paper. The artist's tack holes in the sheet edges; minor surface soiling, verso; otherwise in excellent condition. The Joy Peddler by Abraham H. Schoenfeld is a novel from 1927about the life of a retired Madame, Geannette, and the house she runs. Although in its day the book was classified as erotica, the work is inspired by philosophical and religious symbolism. 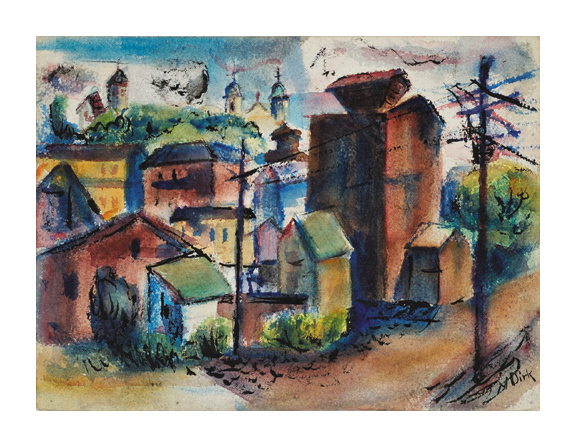 Gloucester - - 1949, Watercolor. Image size 7 5/8 x 10 1/8 inches (194 x 257 mm). A fine modernist work, with fresh colors, on heavy watercolor paper, the image extending to the sheet edges. The artist's tack holes in the sheet edges, otherwise in excellent condition. 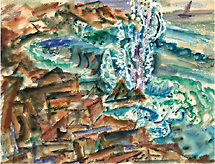 Washerwoman's Reef - - c.1949, Watercolor. Image size 14 1/2 x 18 1/2 inches (362 x 470 mm); sheet size 14 3/4 x 19 3/4 inches (375 x 502 mm). 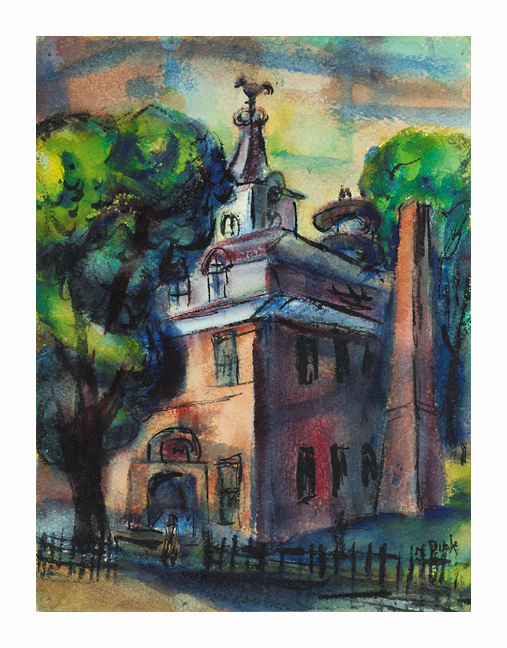 Meeting Hall, Rockport - - 1950, Watercolor. Image size 10 1/4 x 7 3/4 inches (260 x 197 mm). 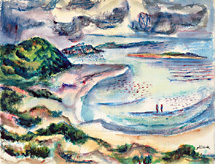 Unending March - Crane's Beach - - c.1951, Watercolor. Image size 14 1/4 x 18 1/2 inches (362 x 470 mm); sheet size 14 1/2 x 19 3/4 inches (368 x 502 mm).